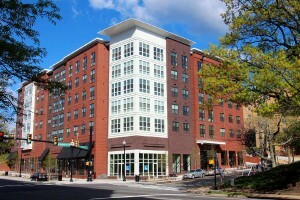 The Shell is an affordable apartment complex located in Arlington’s Columbia Heights West neighborhood. This six-story building contains 83 apartments and 6,600 square feet of ground floor retail space. The building has a spacious lobby, fitness center, 800-square-foot community center, 3,700-square-foot landscaped courtyard, and two levels of underground parking. The project is also EarthCraft certified and features a green roof. The Shell was developed by AHC Inc., a non-profit housing developer founded in Arlington and now operating in Virginia and Maryland. AHC, Inc. combined undeveloped land and a portion of the parking lot at its Harvey Hall apartment complex and acquired the adjacent Shell gas station property to create this 1.08-acre site. Construction was fully completed in spring 2015. Project partners included Arlington County, Cunningham l Quill Architects, Harkins Builders, Virginia Housing Development Authority, Capital One Bank and Hudson Housing Capital. Nineteen of the units are affordable to households earning up to 50% of the Area Median Income (AMI), currently $43,700 a two-person household and $54,600 for a four-person household. The remainder are affordable to households earning up to 60% of AMI, roughly $65,000 for a family of four. The complex includes a range of apartment units to accommodate different needs, including five efficiency units, 10 one-bedrooms, 63 two-bedrooms and 5 three-bedrooms.